A clean work space is more than just being tidy, it's knowing there's someone ensuring the health of your professional environment. Someone focused on details. Someone who's always seeking ways to improve that space. With Sizemore Janitorial, you can rest assured that with everything we do, we're putting you FIRST. 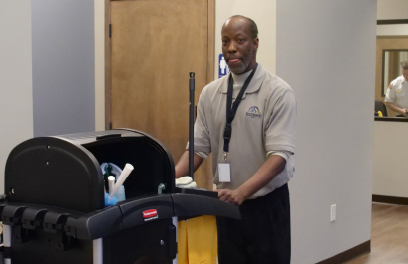 Sizemore understands the value of a sustainable, yet flexible janitorial program in today's business culture. Maintaining quality and reliability is why Sizemore is one the country's largest single-source providers. Through improvements such as eco-friendly products, ergonomic tools, new efficient equipment and self-auditing programs we have made improvements in our culture which in turn has resulted in better workplaces for our customers and team members. "Southwire Company one of North America's leading wire and cable manufacturer, has entrusted Sizemore Janitorial Services to clean our offices over the past ten years and they continue to do an excellent job throughout all their assigned facilities." Sizemore® is the registered trademark of Sizemore, Inc. | WorkKeys® is the registered trademark of ACT, Inc.